Having the right swim training gear can make your swimmers stronger. Swim training is essential to ensure your swimmers are able to improve their technique and build strength to become faster, better swimmers. One of the best ways to do this is to have the right swim training gear on hand for all your swimmers. If you are looking to stock up on gear for this coming fall season, now is the time to learn about the major components you need to help your swimmers improve their technique and build strength in the critical areas of the body. Strengthening the upper body is essential to create a strong swimmer. One of the best ways to do this is to train while your legs are incapacitated. The Swim Stuff Pull Buoys keeps swimmers’ legs stationary while they are swimming so their arms and upper bodies have to do more of the work. This builds muscle in the upper body and allows swimmers to focus on their upper body technique. The Swim Stuff 2.0 Pull Buoy is the perfect size for adult swimmers, helping them enhance their swimming. This tool is available in black and white, black and red, and navy and gold. For the younger swimmers on your team, the Swim Stuff 2.0 Junior Pull Buoy is the perfect option. This smaller version of the pull buoy fits perfectly between every young swimmers’ knees to help them in the same way the adult version does. This piece of equipment is available in the same colors as the adult version. Once swimmers are done working on their upper body strength and technique, the Swim Stuff Short Swim Fins can be the perfect tool to start working on leg strength. The short length of these fins creates the perfect amount of resistance to make swimmers work harder without causing too much strain on the leg muscles. 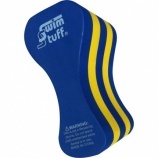 When used properly, these fins can build strength in the legs and core and help swimmers become stronger in the water. The fins are color-coded by size to ensure fast pairing and selection of the right size. Learning to swim well, developing strength, and enhancing performance are major reasons to use these tools. If you don’t already have these tools on hand for your swim team or you need to replace old equipment, fall is the perfect time to start adding to your equipment. With these tools, you can help your swimmers become even better.